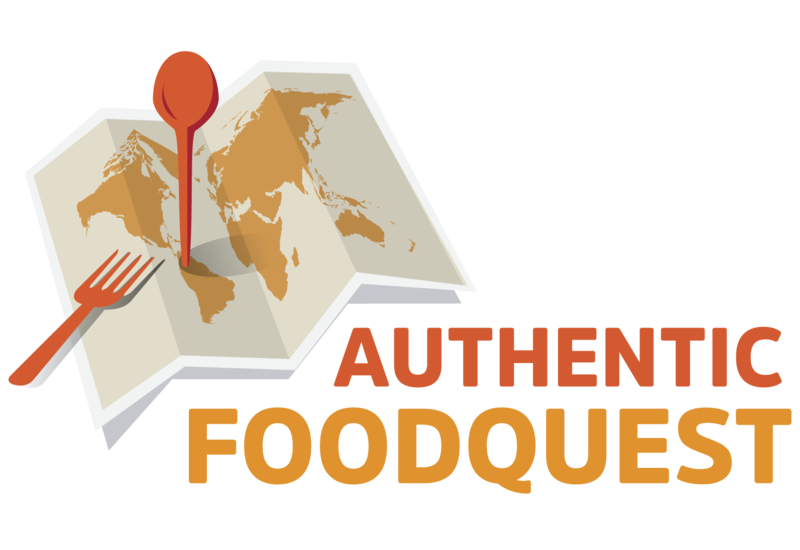 Exploring a destination through food is our mission at Authentic Food Quest. Our goal is to highlight the local and authentic dishes you should not miss on your travels. Lisbon is a city neither one of us had ever visited, and taking a Lisbon food tour to uncover the local gems and dive into the rich culinary history was an obvious must-do. Before going to Portugal, we actually didn’t know much about the local cuisine. We were familiar Port wines, bacalhau (codfish) and had only heard about the famous Pastéis de nata. 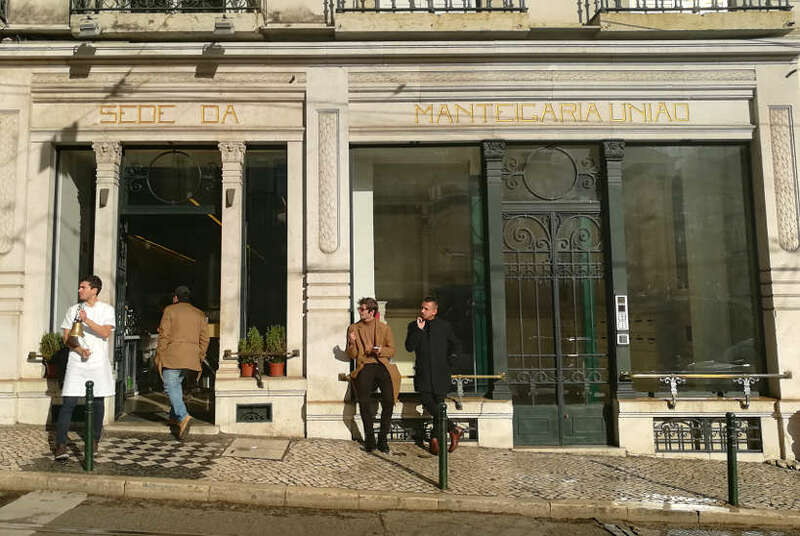 To delve into the food culture in Lisbon we partnered with Context Travel for a Lisbon Food Tour on their aptly titled Bica to Ginja Food Tour, covering Portugal’s iconic foods. 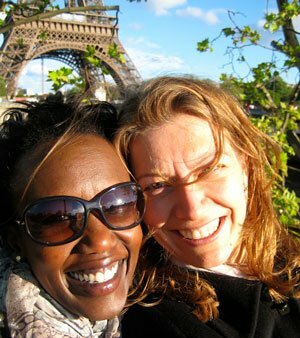 Context Travel is known for offering small group tours for the intellectually curious travelers. When we learned they had recently started offering tours in Lisbon, we jumped at the opportunity to partner with them again. This was our third food tour with Context Travel. 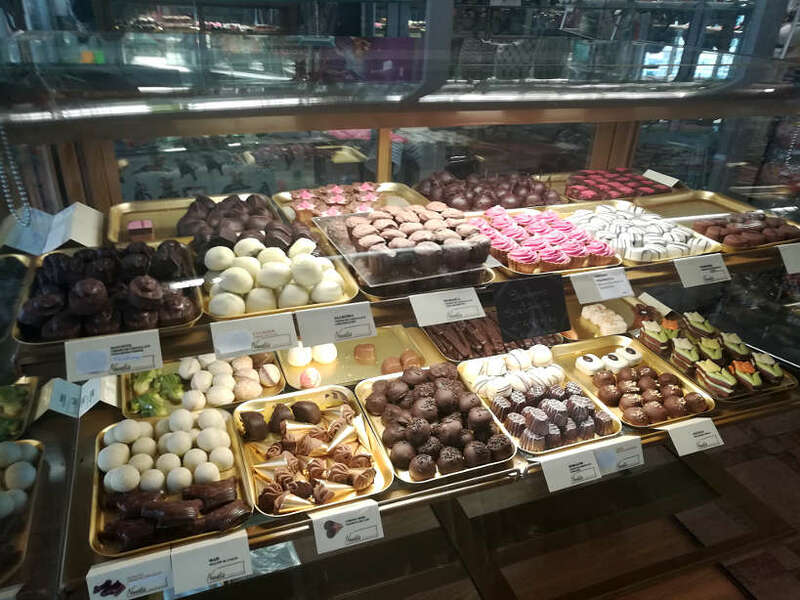 We had exceptional experiences in Paris on a chocolate food tour and in Bangkok, discovering the street food in Chinatown. 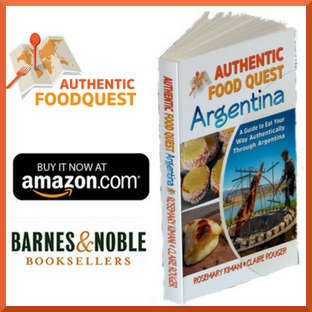 What we really enjoy about food tours with Context Travel is getting a real in-depth perspective about the food, from locals. On the Lisbon food tour, our guide Patricia is not only local but also a professional chef. 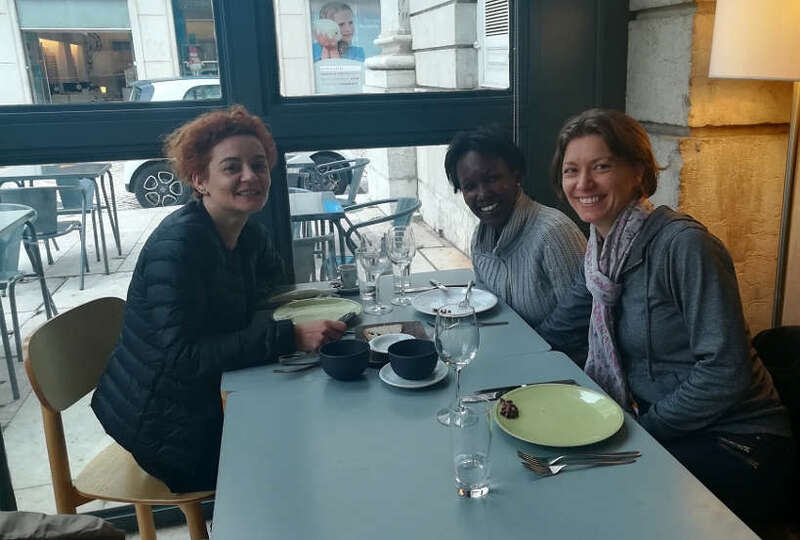 For over three hours, on a private tour, we took our taste buds on an adventure, in the Chiado and Baixa neighborhoods, sampling and learning about the iconic foods in Lisbon. Going to Lisbon without tasting the iconic Pastéis de Nata is like going to Paris and missing the Eiffel Tower, or New York and 5th Avenue. To taste this iconic Portuguese pastry, there is no better place than Manteigaria deemed to make the best Pastéis de Nata in Lisbon. This recently opened bakery only makes Pastéis de Nata. The store, Manteigaria, is actually an ex-butter shop, and they kept the name and the old storefront. Best is to wait until the bell rings, signaling that a new tray of freshly baked Pastéis de Nata is ready to be served. Eaten warm, these little pastries are divine. The crust is fine, crispy and delicious. The custard is rich with the perfect texture. An outstanding combination! Their secret formula lies in the artisanal production with the best quality ingredients following the original recipe. Made right in front of you, you can watch the preparation process while enjoying your pastry. To accompany this delightful pastry, we had a Portuguese coffee called Bica which is similar to an espresso. If you want it with milk, then order a Pingo. To understand the food and ingredients, we visited Ribeira market, the main Lisbon market since 1892. The market is divided into two parts. The traditional market, filled with stands selling fresh produce. And the food court section, which has been managed by Time Out Lisboa Magazine since 2014. Our tour focused on the traditional market. Popular with chefs and locals alike, this market features primarily Portuguese fruits and vegetables from all over the country. 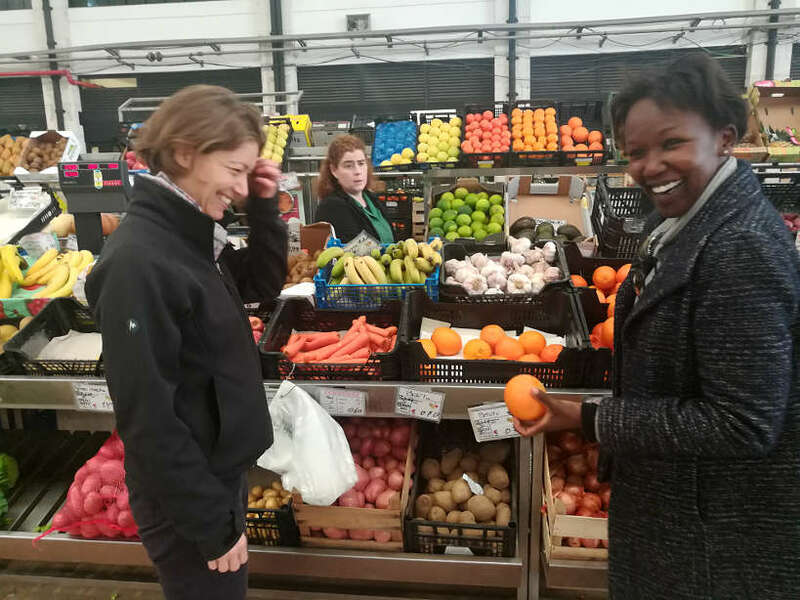 As we leisurely made our way through the market, we admired the colorful fruits and vegetables and tasted unique vegetables, including some of the sweetest oranges from the Azores region. We learned that the Portuguese cook with what is available in season and we did not see much imported produce at the market. An impressive fish section awaited us as we turned the corner from the fresh produce area. We saw a great variety of popular fish and seafood, including swordfish and the famous sardines and mackerel. Also on display was fresh codfish or bacalhau. Prior to that, we had typically seen codfish, salted and dried. 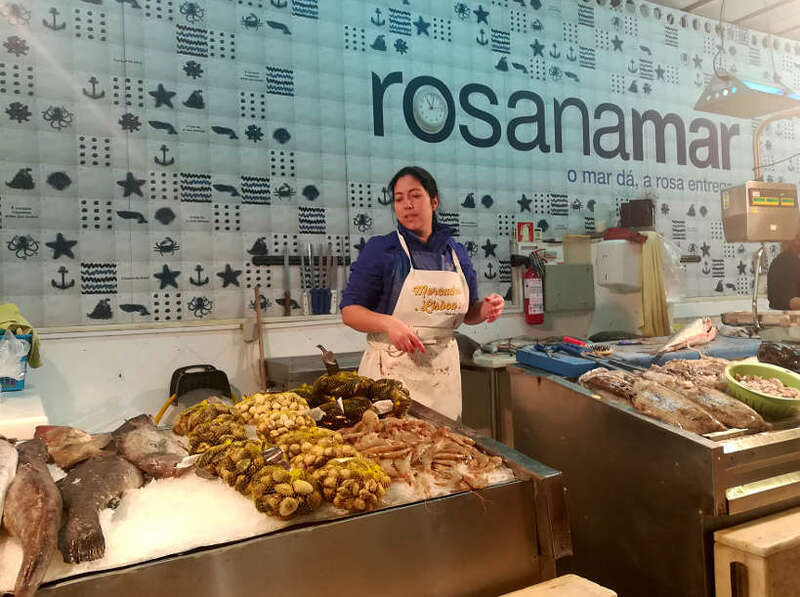 We learned from Patricia, that many Portuguese don’t even know that fresh codfish exists because they are so accustomed to eating it dried and salted. With Patricia, being a professional chef, she told us about the dishes she makes with the local products. She personally shops at the Ribeira market and knows some of the vendors, making the visit very personalized. While the visit focused on the traditional part of the market, it is worth visiting the Time Out market, which is a gastronomic destination. 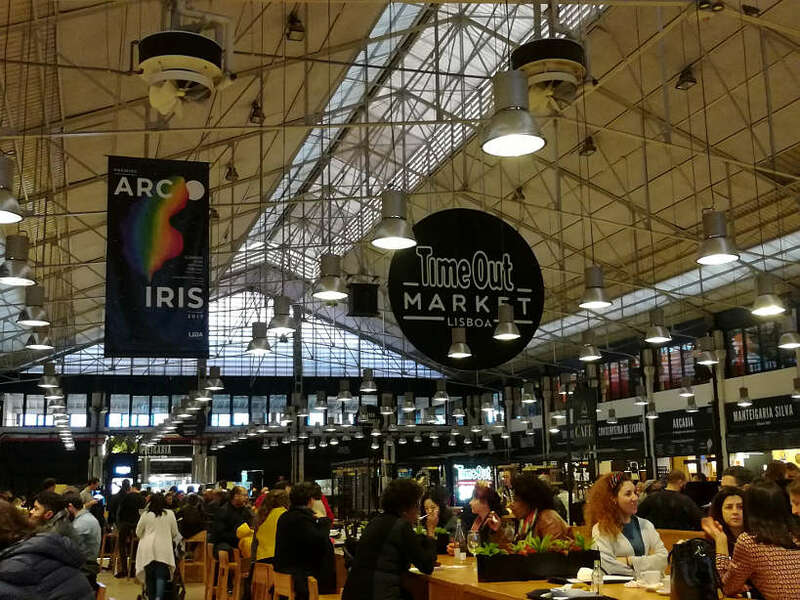 With a mix of renowned chefs’ stalls and a range of local specialties, the popular Time Out market is a great place to start for people visiting Lisbon for the first time. 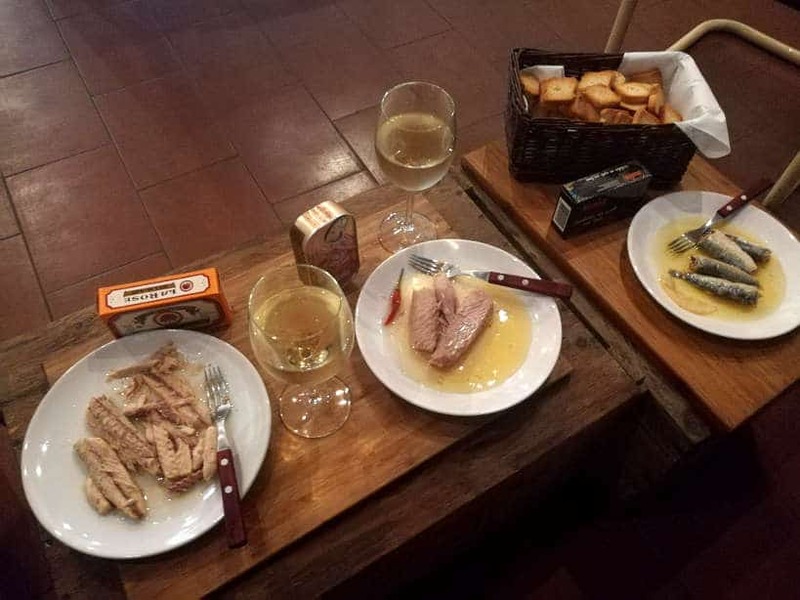 You will find some of the best Portuguese hams and cured meats, traditional canned fish, a variety of breads, desserts, Portuguese wines and port and much more. As we walked to our next stop, Patricia pointed out a number of hidden local spots behind the market, which sell delicious local treats. 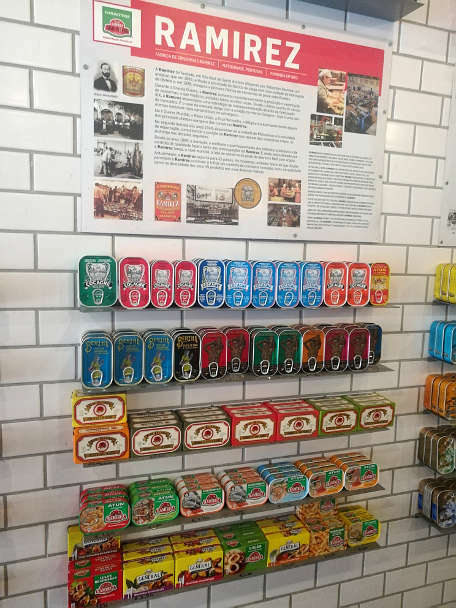 Sampling canned fish might sound odd but it is actually making a culinary renaissance in Lisbon. While canned fish used to be eaten when food was scarce, it is now served as a delicacy in many restaurants of the Portuguese capital. 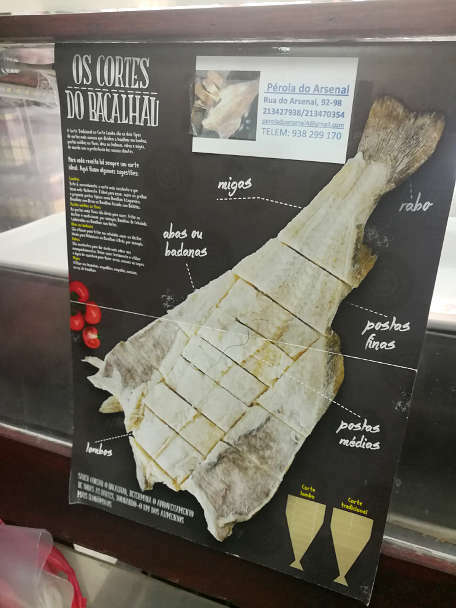 At Loja Das Conservas, you will find many Portuguese brands represented in the store owned by the National Association of the Fish Canning Industry. This is the ideal place not only to sample several cans of fish but also to buy gifts as these stylish cans make for the perfect souvenir. We sampled canned mackerel with curry, tuna with red chili and sardines in olive oil with lemon. Served with white wine from the Alentejo region and small toasts, this was the perfect introduction to Petiscos. Petiscos are small bites to eat with a glass of wine or beer and share with friends. Although often compared to tapas, Petiscos are unique to Portugal. While all the cans were delicious, our preference was the mackerel in the curry sauce and the spicy tuna. This made for a fun experience! Mercearia Pérola Do Arsenal is a local food store in Cais do Sodre. This neighborhood located near the river used to cater to the marines and the people working in the fishing industry. This food store is known for its Bacalhau or codfish, the emblematic fish of Portugal. Here you can find different cuts of the codfish, from the cheeks to the tail. The store also has a nice section of Portuguese wines and Porto, the famous sweet wine from Porto. 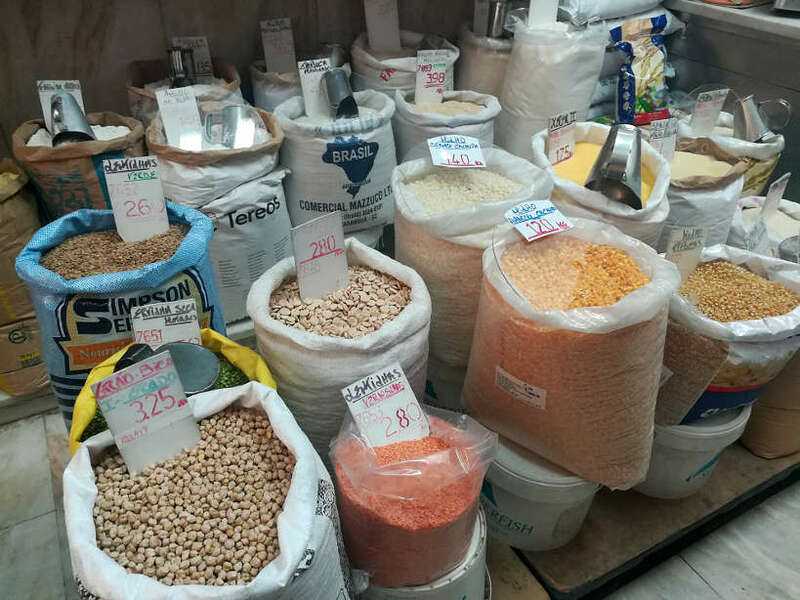 At the back of the store, you’ll find a rich variety of beans used in Portuguese cuisine. This is a great store to find all the traditional food products of Portugal. On our way to our next stop, we walked on the main street of Lisbon called Rua Augusta. This is Lisbon’s main pedestrian street. It starts from Praco do Commercio and leads to Rossio Square, two of the most beautiful squares in Lisbon. Rua Augusta is a lively street with mosaic pavement, artisanal food stores, flower shops and clothing, as well as cafe and pastry shops. As we made our way around the city, Patricia took us to have our very first taste of Ginjinha. 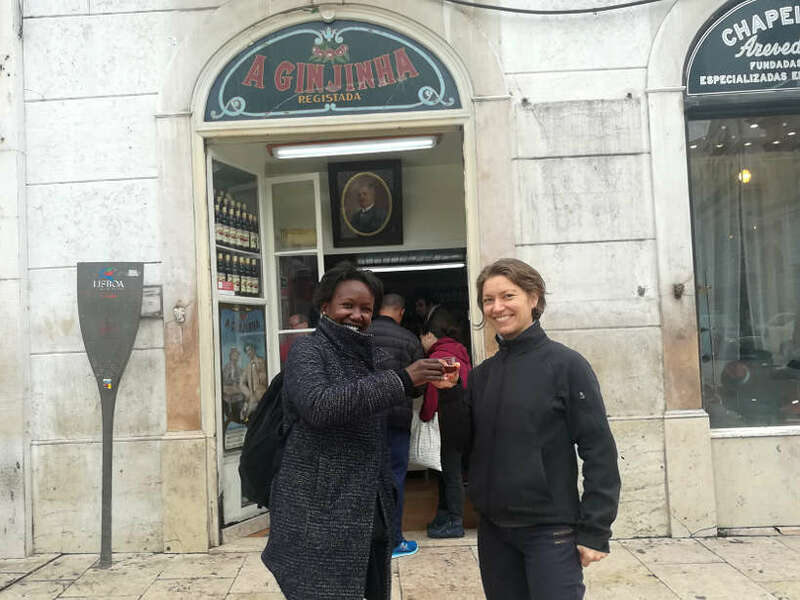 Prior to the Lisbon food tour, while walking around the city, we had seen several small signs selling “ginjinha.” Not knowing what it was, we never dared to try it. So, when Patricia told us our next stop was to taste the Portuguese favorite liquor, we could not wait. 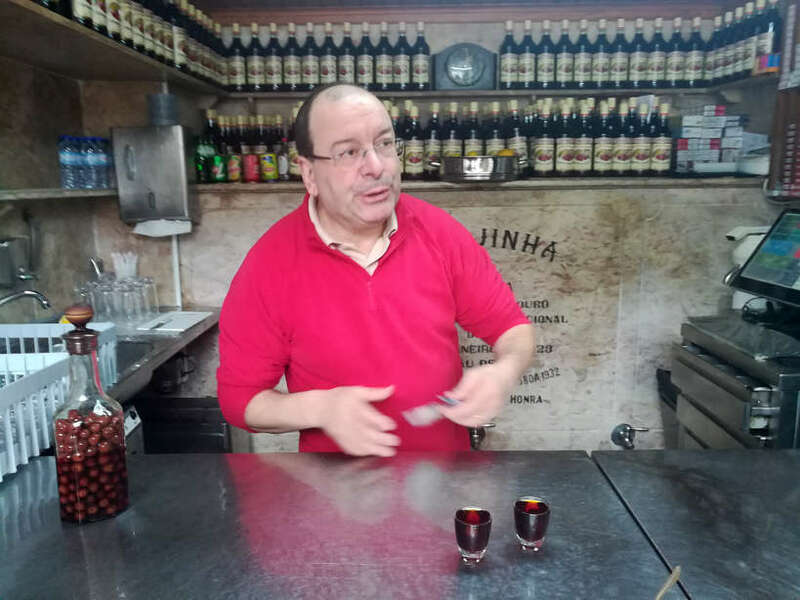 Ginjinha or ginja, is a sour cherry liquor native to Portugal, and a typical drink in central Portugal around Lisbon and the town of Óbidos. It is 100% Portuguese and not found anywhere else in the world. Our stop was at the very first store in Lisbon to commercialize or sell Ginjinha. This liquor is made by letting cherries ferment in brandy, and then adding sugar, water and cinnamon. Tasting Ginjinha with the cherry! 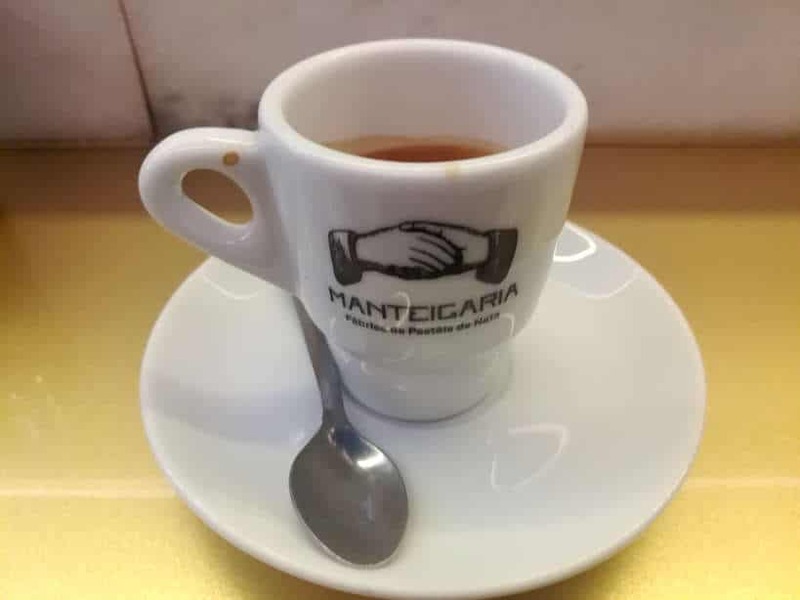 The drink is served in a shot glass and costs €1.0 euro. You can have it with a cherry or without. We had it with a cherry and found it quite sweet. The alcohol percentage is quite strong at 23%, though we were quite surprised that it didn’t taste too alcoholic. Perhaps, due to all the sugar. In Lisbon, ginjinha is consumed as an aperitif or as an after dinner drink. Our last stop for the tour was at the impressive national theater of Portugal, the Teatro Nacional Dona Maria II. 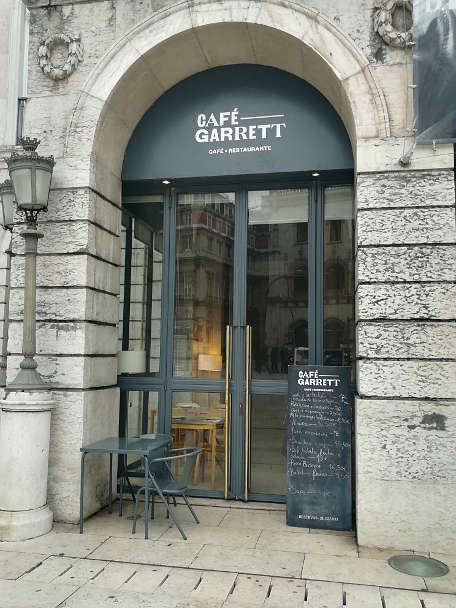 Café Garrett, the restaurant at the theater, is a hidden gem and often by passed by tourists. Here, we had pastéis de bacalhau, one of the 365+ way of preparing codfish. This particular preparation was deep fried cod with chives. While it may not sound appetizing it is in fact quite delicious. These traditional fish cakes are prepared on order and served hot. They are best eaten in small bites. We accompanied the codfish with glasses of Vinho Verde wine. While we did not visit national theater, guided tours are offered which take you through the strange history of the Teatro Nacional de Dona Maria II. After a few hours with Patricia, we really felt that we had gained a much greater appreciation for the local Portuguese cuisine. The opportunity to take a food tour with a professional chef was a wonderful way to get immersed into the heart of the food culture. 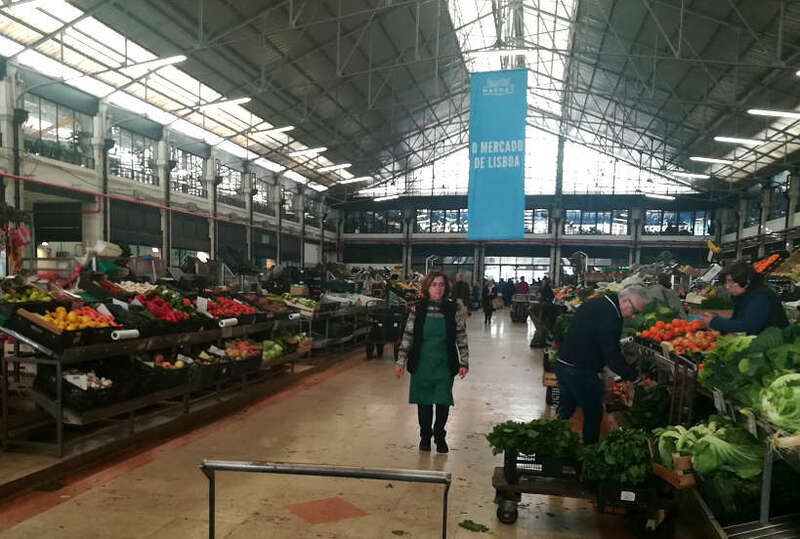 Visiting the market, seeing the local seasonal products and sampling the delectable cuisine was the perfect introduction to Portugal’s iconic foods. If Lisbon is on your travel plans, don’t hesitate to sign up for a Lisbon food tour with Context Travel. Our tour was a private tour and having a chef’s perspective added much more than we could have imagined. 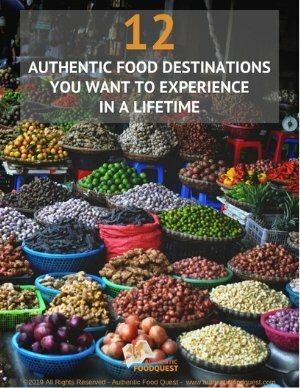 Go deeper on your travels, through food, with Context Travel, a unique tour company for the intellectually curious traveler. 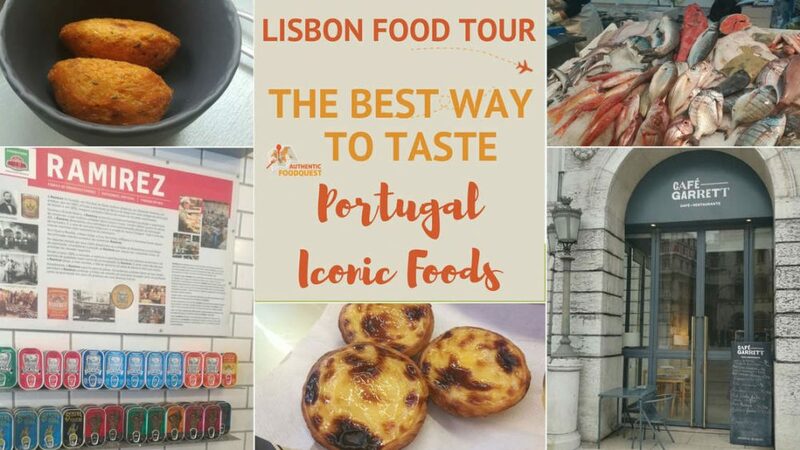 Tour: Book your Bica to Ginja: Lisbon Food Tour directly with Context on their website Lisbon food tours. 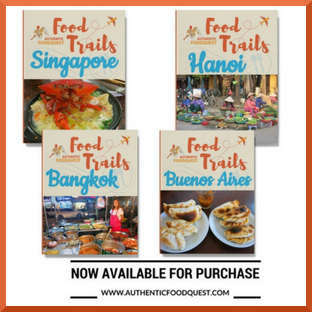 Customized food tour led by a knowledgeable local chef. 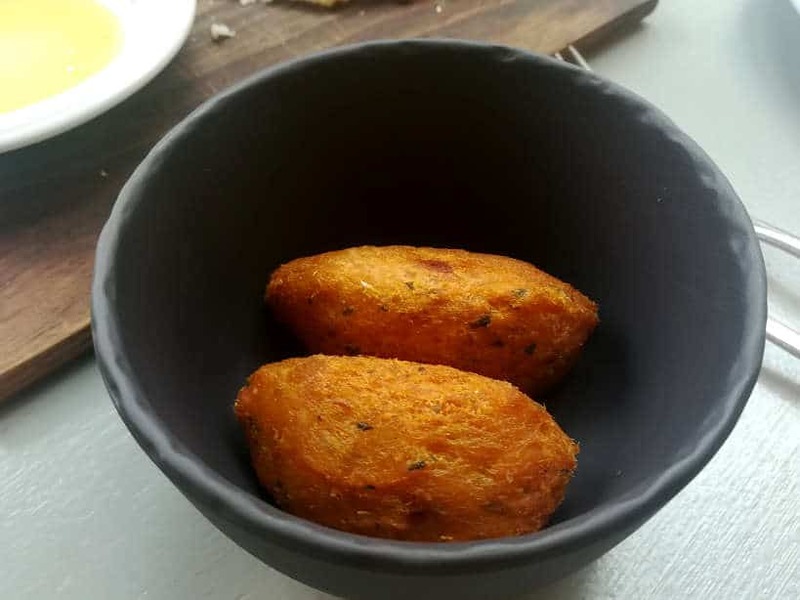 OMG, I love everything fried so I would definitely love that Pateis de bacalhau – but it looks like everything is so good on this tour and tasting experience. I would love to experience this! If you love fried food Noel, you will love Portugal. Lot’s of delicately fried snacks, all quite fresh and tasty. Hope you make it to Lisbon soon and experience this food tour. Cheers! I wish I did a food tour when I was in Lisbon (god, its been 6 years I think since I was last there). Hoping to be back soon as I loved this city and hopefully do some more time checking out the places near the city. Only did Sintra and that was amazing. It’s time to go back to Portugal, Danik. I’m sure it’s changed in six years. Lisbon is truly amazing and Sintra, magical. Do you recall any of the local dishes you tried? Appreciate you stopping by! We were in Spain last year and so sad we didn’t have time to visit Portugal. But we hope to get there someday! And we are total foodies so we’d love to try some of these places. The Pastéis de Nata sound amazing! And Casa Pereira da Conceição is calling our names because we are all about sweets. Great post! Thank you for sharing all of this yummy post, Rosemary and Claire! I’m planning to visit Portugal this summer. 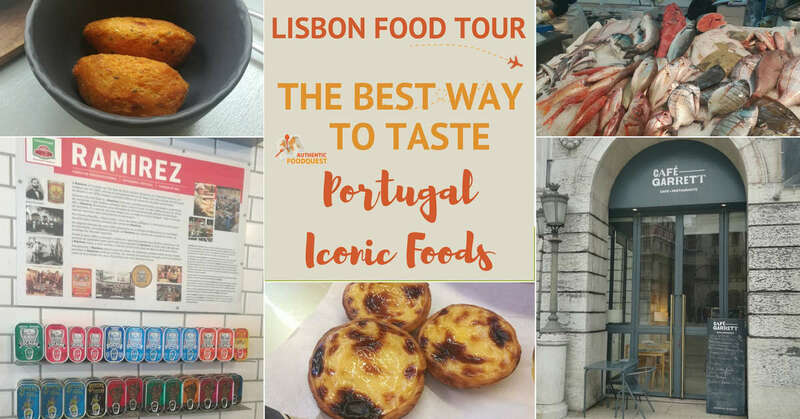 Context Travel is a favourite – I’m so happy to learn they have a food tour in Lisbon! The iconic Pastéis de Nata Portuguese pastry looks incredible. Thanks for the coffee ordering tip – I’ll order a Pingo 🙂 I will definitely book this tour when I visit Lisbon. I agree, touring with a professional chef would be wonderful – I’ll request Patricia. 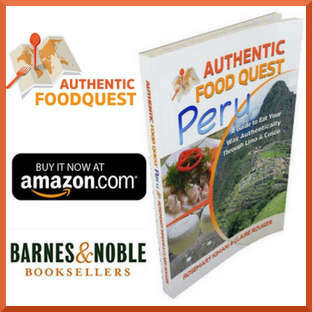 Perfect Nancy, you’ll love exploring the food with Context Travel and in particular with Patricia. Do let us know if you have any questions as you prepare for your upcoming trip. Cheers! I was in Lisbon last month and did stop at Pastéis de Nata! I wish I could take their food home with me I loved it so much. I didn’t have time to visit all of these places you listed though, so I’ll have to bookmark this for next time. 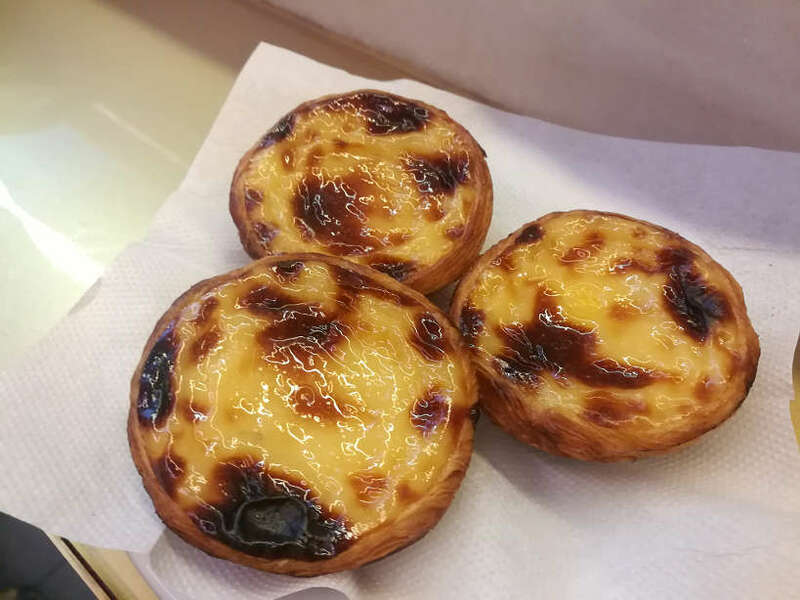 You are right, the Pasteis de Nata are so worth finding a way to bring them back home 🙂 Keep this article for your next trip or better yet, schedule a tour with Context Tour for a delicious taste of Lisbon. I love taking food tours like this and will look up Context for future ones. I really love that they put the cuisine into context, and introduce me to a neighborhood or two more deeply than I might see it on my own. Plus I’m a huge fan of Portuguese food and have been to Porto and Alentejo recently not to Lisbon! That’s awesome to meet another Portugal fan. A trip to Lisbon is definitively a must and a food tour with Context Travel will introduce you to the delights of Lisbon. Totally agree, food tours are a wonderful way to discover neighborhoods, deeply. Thanks for stopping by. 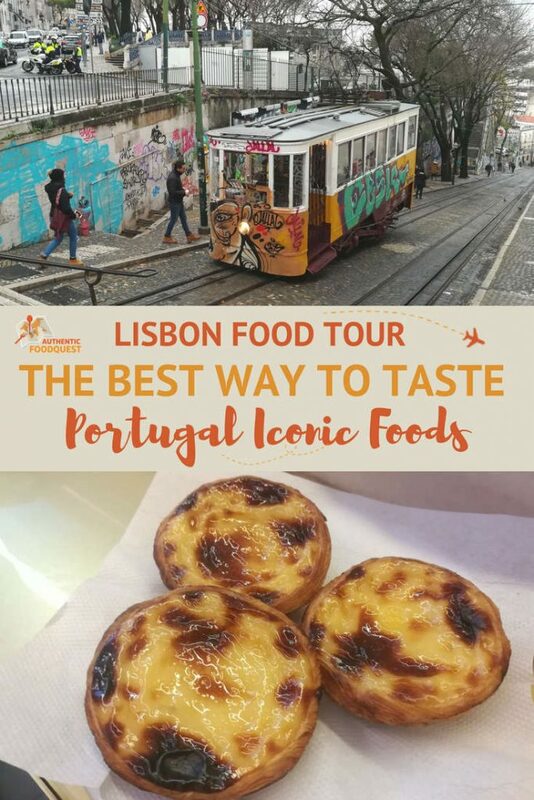 Well, you pretty much had me at Lisbon and food tour. And then I saw those amazing pasteis de nata – swoon!! I love those sweet, creamy pastries so much. And those codfish croquettes looks pretty amazing too. A food tour is the best ways to appreciate any new city and culture. It sounds like he Context Travel tour was fantastic! Bookmarking for a future visit. Awesome to hear Claudia, so glad the article captured your taste buds 🙂 Now, the next step is a trip to Portugal for a local tour with Context Travels 🙂 Hope you make it to Portugal soon. Thanks for stopping by!! I love Pastéis de Nata! I wish I had known about Manteigaria when I was there, but I may be in Lisbon towards the end of the year, so I am definitely bookmarking this page. Thanks for the other fabulous suggestions. You are most welcome Janine, and so glad you enjoyed discovering Manteigaria. Definitively a must visit on your next trip to Lisbon. The best is get the pasteis de nata when they ring the bell. That means they are freshly out of the hot oven! Yum! Let us know if you have any questions as you prepare for your trip back. Cheers! I’ve never been on a food tour before, but it seems quite an interesting experience. I’ve heard so much about Mercado da Ribeiro, so I would love to explore it someday. Oh, that gourmet chocolate looks so tasty!!! A food tour really takes your experience of a place to a deeper level. You not only get to taste the local food, but also learn about the local culture and influences. Check out Context Travels for your next trip, they offer tours all over the world. Glad you enjoyed the article! Food tours are indeed a great way to connect locally! We also love markets and Ribeira market is a load of fun to explore. It’s wonderful the little tidbits you pick up on food tours led by locals. Where have you taken your favorite food tours? Thanks for stopping by!